Comment: 2 story stucco home. 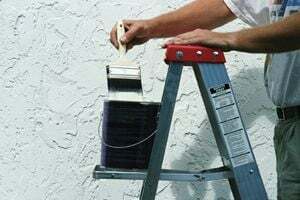 Paint exterior walls, facial boards, shutters, and trim. Comment: front door and frame needs to be sanded and repainted. house trim needs repainted. Comment: Front door, garage doors to be painted. Paint purchased. Las Vegas Painting Contractors are rated 4.83 out of 5 based on 1,097 reviews of 73 pros. Not Looking for Painting Contractors in Las Vegas, NV?